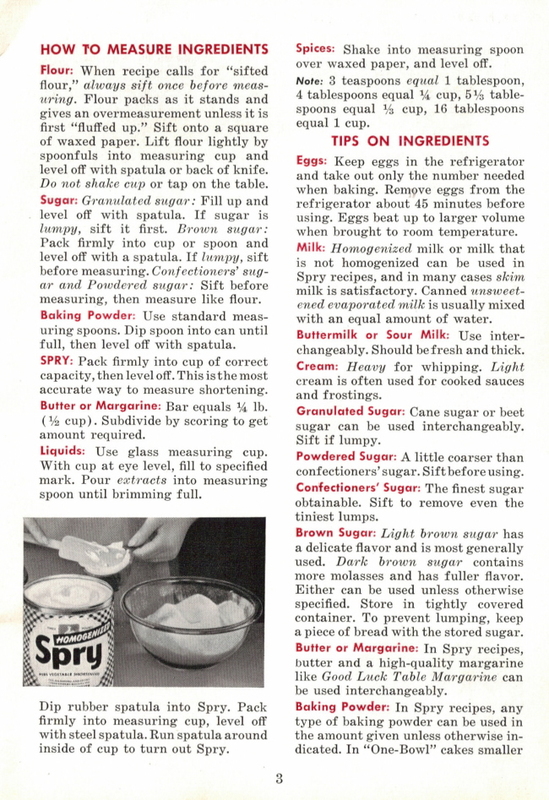 Here is the first part of page 3 of the vintage cookbook: Home Baking Made Easy that was published in 1953 by Lever Brothers Company. Flour: When recipe calls for “sifted flour,” always sift once before measuring. Flour packs as it stands and gives an overmeasurement unless it is first “fluffed up.” Sift onto a square of waxed paper. Lift flour lightly by spoonfuls into measuring cup and level off with spatula or back of knife. Do not shake cup or tap on the table. Sugar: Granulated sugar: Fill up and level off with spatula. 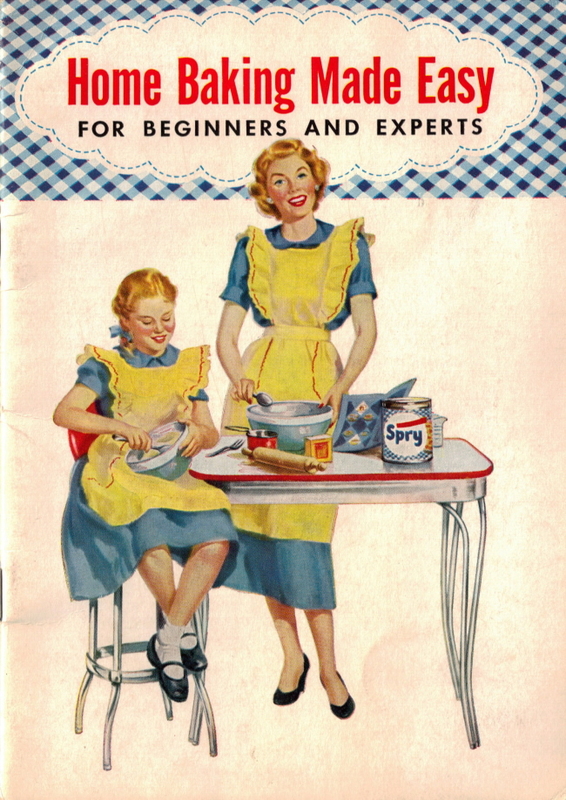 If sugar is lumpy, sift it first. Brown sugar: Pack firmly into cup or spoon and level off with a spatula. If lumpy, sift before measuring. Confectioners’ sugar and Powdered sugar: Sift before measuring, then measure like flour. Baking Powder: Use standard measuring spoons. Dip spoon into can until full, then level off with spatula. SPRY: Pack firmly into cup of correct capacity, then level off. This is the most accurate way to measure shortening. Butter or Margarine: Bar equals 1/4 lb. (1/2 cup). Subdivide by scoring to get amount required. Liquids: Use glass measuring cup. With cup at eye level, fill to specified mark. Pour extracts into measuring spoon until brimming full. 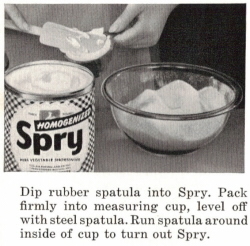 Dip rubber spatula into Spry. Pack firmly into measuring cup, level off with steel spatula. Run spatula around inside of cup to turn out Spry. Spices: Shake into measuring spoon over waxed paper, and level off. Note: 3 teaspoons equal 1 tablespoon, 4 tablespoons equal 1/4 cup, 5 1/3 tablespoons equal 1/3 cup, 16 tablespoons equal 1 cup.